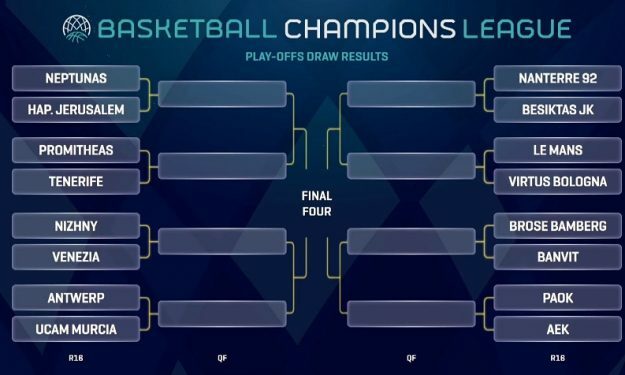 The Basketball Champions League playoffs have been set, and the fans are in for a treat. 16 teams from ten different countries have remained in the 2018-2019 Basketball Champions League. The first leg of the playoffs will be played on March 5-6 and the second leg, one week later, on March 12-13. Here are the eight match-ups for the upcoming Round of 16. The four teams to advance from the Quarter-Finals will meet in the Final Four on 3-5 May. The location will be announced after completion of the Quarter-Finals, at the end of the first week of April. An additional draw will determine the Semi-Finals and will take place in the Final Four host city the following week.